I guess living in Yellow Knife would be a lot worse, but people really get stir-crazy in northern New England in the attenuated frozen-mud period we call spring. Mike Perkowitz's photos of Japan were just the ticket this morning (via Conscientious). The inscription on the fountain reads: "I learn only to be content." Joerg also has a link to the work of photographers Bernd and Hilla Becher, founders of the German school of Sachlichkeit, translated as "objectivity". The couple has spent thirty years photographing industrial objects such as water towers and nuclear power cooling towers. But is the mere depiction of realism the aim of the Becher's years of work? They are not cropped, not manipulated, not fictional in any way. These documents present a true and accurate account of the industriality of post-war Europe and America as embodied by its architecture. Perhaps. Unlikely. Women and War, a book and photographic exhibition by Jenny Matthews. Another portfolio is on today's BBC front page (scroll to the bottom). 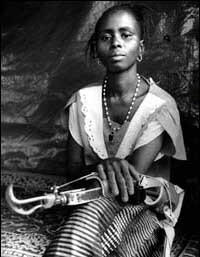 The woman in this picture is from Sierra Leone. A Refusenik Speaks Monday night we went to hear a presentation by one of the Israeli refuseniks, Stav Adivi. He is actually the highest ranking military reserve office to sign the "Courage to Refuse" statement, and is currently on a tour across the United States speaking to primarily Jewish audiences. Adivi, a solemn man who rarely smiled, made it very clear that he is not a pacifist. He described himself as a Zionist and nationalist. "I wear the IDF uniform; I've been in the military for over 25 years; I would not hesitate to defend my country if it were attacked by a neighbor." He admitted that he has been on the other side: "I've participated in settlement building; I've participated in house demolitions. I simply came to see that the occupation was immoral, that we were humiliating people, and the violence was coming out of our own actions." He believes the occupation is counter-productive to the safety, security, and future of Israel. When asked by someone in the audience what advice he had for the United States in Iraq, he said, "Don't repeat our mistakes. Leave as soon as you can." He said it is simple: occupation creates resentment. Resentment breeds hatred. Hatred turns into violence. When the occupier feels threatened, they begin to erode the human rights of the occupied people, and you are caught in a cycle of escalating violence. "And occupation always ends up corrupting the soul of the occupier," he said. "Then those people re-enter society, and they bring these experiences with them." "For us," he said, "the 1967 war has never ended. I hope that the United States will not still be at war 35 years from now." or even the day, with a thorny night. sorrow detaining us, with its lesson of tears. it would return the flowers, later, to their work. But no withering autumn ever touched us. as rightfully empowered as the dew. Well, it was a restorative weekend. Yesterday's outing in the rain spurred us on to another adventure today. After looking at zoomed-in regional topographic maps last evening we "discovered" a section of rapids and falls in the river that we'd never visited before -- and it turned out to be spectacular. You have to walk in from the road and the falls aren't visible from any place other than this particular access point. Fishermen know about it, and canoeists and kayakers. There were rising water warning signs on trees along the trail, and we passed memorials to two of the many people who have drowned here -- one carefully chiseled into a boulder that also wore a small flag and a photograph of the man held down by a small rock, from a few years ago; the other a dark slate headstone bearing the name of a nineteen-year-old Maine man who died here in 1895. With the river running so high and full, we could hear the roar long before the water came into view. We sat up on a ledge and ate our lunch without talking, mesmerized by the water. Below us, a few patient fishermen were casting into the pools under the falls for northern pike and perch. While we were there the weather broke and a high front rolled in from the west, bringing white clouds and a blue sky and turning the foaming cascades so dazzlingly white it was hard to look at them. The rock in our area is mostly granite, with wide veins of milky quartz. My backrest up on our lunchtime ledge was a perfect little chair of white quartz. The water-polished rocks that make the falls are a deep grey with occasional crystals of pink and rust, and they're as beautiful up close as they are at a distance. Above the flood line, every surface is encrusted with moss and greyish-green lichens, and in the woods the ferns are starting to send up tightly-curled fiddleheads, each like the carved end of a green violin. I found a purple crayfish claw, and rescued a tiny-scaled silver minnow stranded in a rock pool above the receding water; it blinked its bright eyes at me for a brief moment in my palm, and then flashed back into the river. Back home, the day got warmer and warmer. The poolish (yeast sponge) for the bread I had started before yesterday's expedition had bubbled away in the refrigerator overnight and this morning. While the dough was rising indoors, I got the compost bin moved to its summer location and planted some spinach and baby bok choy. Then we ate outdoors for the first time this season -- hot crusty bread with salad and grilled teriyaki chicken -- while a pair of tufted titmice hopped in the tree overhead. Heaven. The bread is a whole wheat and unbleached-white French country-style round loaf from the best bread cookbook I've ever used, Joe Ortiz's The Village Baker (not available at Amazon). You need to bake it on tiles or a baking stone in a very hot oven with a steam-pan or frequent misting, but it's worth the trouble. I go for months without baking bread, because in recent years it's become easier to get really good bread here, but it definitely worked today as part of the take-care-of-ourselves plan. At the weekly peace vigil yesterday I was talking to a friend and fellow organizer who is a Korean war veteran. He always wears a “Veterans for Peace” hat and carries an American flag, along with a sign reading something like “Resist Facism” or “No Empire”. He’s a great guy. Anyway, we were talking about what to do next, where to put our energy, about the 2004 elections and a bunch of other topics, and waving at the few cars or pedestrians who honked or said thank you to our dwindling band. As we were taking down our signs and rolling up the banners, another one of the demonstrators, also a very intelligent, committed guy, came up and said he was really disturbed by the flag. My husband and I had to go, so we reluctantly left the two of them engaged in a more distressing discussion than any we’d had with passers-by. In the car I said I was really running out of steam for this, and said it certainly didn’t seem necessary to start taking each other apart too. J. agreed and said he thought everybody was really tired out. Fried, actually. I asked what he thought we should do, and said I didn’t feel demonstrating was effective anymore, but that I didn’t have the energy or the conviction to immediately switch over to the upcoming campaign. I want to feel like a human being again, I said. To have a life. To get out in the garden. Be creative again. He said he thought we all desperately needed to take a break and take care of ourselves and try to recoup some energy. The two of us had hoped to go up to Canada this weekend but couldn’t swing it -- too much work and too many other obligations -- but today, even though it was clammy and wet, we took off around 11:00 am and drove south, the long scenic way, to take some photographs. Last week we had spotted some beautiful newly-plowed fields, but it had been both dry and bright that afternoon, and the sinuous, alternating bands of earth and inch-long new green hay didn’t have enough contrast. Today, though, they were gorgeous. Low grey clouds trailing wispy tails dragged against the hills. The rain was slow, light, and persistent, the kind that makes large droplets form along every horizontal branch and hang there forever, swelling impossibly against the force of gravity. It’s the last week of late winter, when you can still see deep into the woods, where thin birches punctuate the grey pages of deciduous forest and the hazy red of swelling maple buds. The river was high, rushing in foaming cascades above emerald-green rapids and then flattening into sheets and slow whirlpools out where the fast water met the deep. 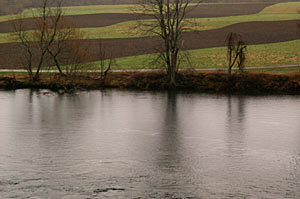 Beyond the river bank, the plowed, striped field stretched for half a mile, clotted earth soaking up the rain. I stood on the bridge and breathed, listening to the water, the rain, the crows in the pines. J. was a small dot beyond the line of dreamy trees at the end of the field. Spring in New England is like the droplets on the trees – a kind of suspended animation, waiting -- waiting -- until the one day when everything bursts and the whole landscape is suddenly alive with pale, tremulous green. But now, as in November, it’s like a tapestry in the Cluny: muted shades that appear grey,mouse-brown, rust, lavender, and olive at a distance, but up close are woven in thin threads of magenta, violet, chartreuse, gold, slate blue and chocolate. In winter I feel like a sharp-edged shadow moving through monochrome. In summer, just one of many bright flashes. But now and in late autumn, I somehow long to be a small furry animal, non-descript and anonymous, or a sharp-eyed falcon watching from a tree: merging with the silent last days of pregnancy and the mystery of Persephone’s return. "Everything around us, dead or alive, in the eyes of a crazy photographer mysteriously takes on many variations, so that a seemingly dead object comes to life through light or by its surroundings...to capture some of this - I suppose that's lyricism." Conscientious has a post today on one of my favorite photographers, August Sander. 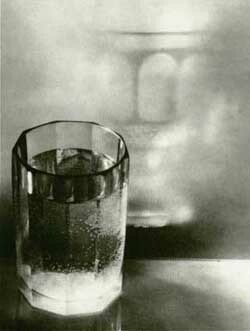 While looking at the links for Sander, I eventually got sidetracked and then lost in the poetic images of another favorite, Josef Sudek. Sudek was apprenticed to a bookbinder prior to WWI, but he lost his right arm while fighting and photographing on the Italian front. He was forced to give up bookbinding and subsequently devoted himself to photography. Here are more images of city and water; cathedrals (he photographed the reconstruction of St. Vitus cathedral in 1928, these may be that series), and still lives and landscapes (with a bio). He also did some astoundingly beautiful panoramics. I’ve recently been following a discussion about personal truth as it is expressed in the supposedly autobiographical web log medium. Posts by languagehat, burningbird, Jonathon Delacour, Caveat Lector , The Happy Tutor and others, and the associated comment threads, discuss whether a blog should be totally honest and self-revelatory, or whether a certain amount of “fiction” is permissible. 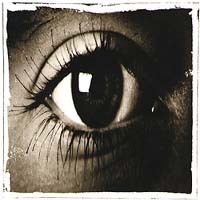 The discussion is both from the point of view of blog writers themselves, and also about our expectations as readers, not only of online journals but of essays and various forms of “creative non-fiction” and autobiography where the line between personal truth-telling and fiction is sometimes blurred. One of the examples that’s received a lot of attention is a vivid incident in an autobiographical Annie Dillard essay about a cat with bloody paws jumping up onto her chest – which the author later admitted hadn’t really happened to her. My own plunge into the blog world is, I think, merely an extension of my life-long habit of journal-keeping and correspondance by letter with various friends, and, more recently, the writing of essays. I’ve always written as honestly as I could, and can’t imagine doing otherwise: it would feel like a betrayal of myself and the people who seem to trust me to be telling the truth. And the reason I write in these mediums is, in fact, both wrapped up in a desire to share my life and in a quest for greater self-knowledge, whether by working out my thoughts on paper or, better yet, through exchange and questioning from those wonderful “others” who are willing to enter into the dance, often for the same reasons. Of course, self-identity is the ultimate slippery fish…there’s the question of whether we can ever truly know ourselves, or if that “self” is merely an unknowable collection of all the ideas of our self held by others (explored to its extreme by Luigi Pirandello in his One, No One, and One Hundred Thousand). Nevertheless, some of us feel compelled to try, and for many of us the blog is a far better medium for knowing and being known than the silence of a private journal. I don’t have a problem with self-invention per se, and certainly not with fiction. But I do think fiction is fiction and honest autobiographical writing is something else. My problem is with deception. If somebody’s telling a highly realistic personal story that is, in fact, a yarn, fine, but I guess I want to know that. For me, writing autobiographically in a public forum, rather than in a private journal or a letter to a close friend, has a lot to do with trust. It’s a contract of sorts. What does it do to that trust-relationship if and when the blog medium becomes rather suspect because a lot of people are writing quasi-autobiographical blogs? On the other hand, I think people have a creative right to write however they want. In examining where my biases are coming from on this, I wonder if one factor is just age. Many young people easily accept and champion pluralistic ways of being, including self-invention and re-invention, and blurred or changed identity, sexual or otherwise, in ways that had barely surfaced when I was young. They also strike me as being far more comfortable with moving in and out of fantasy realities and the so-called real world, and the internet affords a medium for these explorations. It makes me wonder if personal truth and self-expression actually mean something rather different to some of them. I’d be very interested to hear if anybody else has thoughts on this. Another other big factor is cultural. I grew up in an extended family in a small rural town. Everybody knew everything about everyone. A good part of your perceived identity was well-set before you were even before you were born, just on the basis of what people thought about your family. The town was a fishbowl where nobody could get away for long with much deception, and in my household of four adults to one child – me – I quickly learned that I couldn’t get away with much either. It was a lot easier to tell the truth and trade a certain amount of privacy for the benefits of being trusted as a member of a group, whether that meant the family or a wider community. My alternative realities were found at the piano, or in the woods, or in a pile of books up in my tree house, or simply in an increasing habit of inward reflection. We were all pretty much stuck with ourselves and each other; nobody went anywhere: cities were scary, and few people I knew had lived elsewhere or traveled much at all. In that town I had known kids who tried to cheat in school or adults who had been whispered about for having an affair, but it wasn’t until I went away to a big school that I ran into people who had actually invented a whole new identity. There were a couple of students I knew well who, it eventually turned out, had fabricated entire parts of their past, out of insecurity, the desire of sympathy, or just in order to impress the rest of us. They did get away with it for a long time, but when the truth came out, of course it backfired miserably. 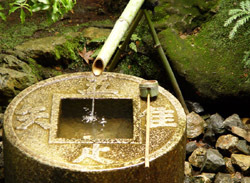 Jonathan Delacour’s discussion of Shishosetsu, the Japanese tradition of autobiographical novels, gives a fascinating glimpse into a different cultural approach. As I’ve gotten to know more about Middle Eastern families and societies, it’s clear that the individual’s right of self-determination and identity there is generally subordinated to the collective good of the community (this is true both in Islam itself and in secular Arab and Persian society) Families operate very differently than in the West (sort of an extreme version of my very old-fashioned home town), with the entire concept of privacy being colored by religious, societal and family expectations. So how has this affected people’s writing about themselves? Yet Iranians, who have been fascinated with Western literary traditions for the last hundred and fifty years, have basically turned their backs on autobiography. Paradoxically, if autobiographies are expected to offer a certain self-reflexivity, whereby the self is a problem unto itself and thinks about itself, Persian literature abounds in that feature. Sufism, or Islamic mysticism, not only allowed radical breaches of public convention and formality but also demanded intense forms of self-meditation. If autobiographies are expected to provide a certain self-glorification and self-congratulation, then again Persian literature contains generous supply of that mode of discourse. Rajaz-khani, for instance, is the ritualized boasting of heroes in epics, and the takhallos tradition allows for the poet’s open expression of self-praise and self-satisfaction. Despite these traditions, Iranians have suppressed or subverted the uninhibited, unformulaic, public disclosure of self. Many factors may have contributed to the paucity of this literary genre. Its absence is perhaps the logical extension of a culture that creates, expects, and even values a sharply defined separation between the inner and the outer, the private and the public. Perhaps it bespeaks a mode of being and behavior that is shaped, or misshaped, by varying degrees and types of censorship, both external and internal. In short, it could be one more manifestation of strong forces of deindividualization, protection, and restraint. This is a wonderful place. It's 50 percent Muslim, 25 percent Christian, and 25 percent Chinese. Tomorrow I'm taking a run-down bus and a boat to Bako National Park, home to the probiscis monkey and about 25 varieties of pythons. Also the raffesia plant, about 30 types of pitcher plants, and all four types of orang-utangs. It is close to 100 degrees in the shade, humidity is about 90 p.c. I'm exactly 2 degrees north of the equator. The winter monsoon ended last month, flying in here on the puddle jumper from 10,000 feet up the Sarawak River was swelled with water colored like a caffe latte with just a tad extra milk in it. Last night I found a Arakanese (mix arab-hindu) restaurant with the local dish called ''black beauty''--i.e., giant mud crab with jasmine rice on the side, cooked in a sauce of local Sarawak green and black peppers. Today is Monday, and after flying out of Kuala Lumpur, I lost track of the time. I thought today was Easter Sunday but that was yesterday, part of the reason is that I am now 15 hours ahead of you and I just let go in this place. The war is a million miles away, even though this is a Muslim country, by and large, the people are very laid back. My cabbie from the airport said, ''we are that way, Malays aren't Arabs.'' In Perak state, PAS, the radical Islamic party, rules. They want an Islamic state with cutting off of hands and the rest. The rest of Malaysia isn't buying it. Then last week, in a shameless display of ignorance and insensitivity (or was it just arrogance?) who was chosen as the main speaker at the annual Good Friday prayers at the Pentagon? None other than Franklin Graham. Maureen Dowd, caustically lampooning the Pentagon planners, writes that Graham spoke after Christian singer Kenna West serenaded the group with a rendition of “There is one God and one faith." When Muslim groups objected, saying this appeared to be a tacit endorsement by the Pentagon of Graham’s position, “Mr. Graham asked for a photo op with Muslim Pentagon employees.” They declined. Gee, I can’t imagine why. In Iraqi Artists Get A Clean Canvas (Washington Post), a Baghdad gallery proprietor and a gathered group of 100 Iraqi artists and writers talk and worry about the future. …"It's the Mongol invasion all over again," Khalil said, sitting with his friends, Salman Radi, a sculptor, and Saad Hadi, an art critic. "The first thing I want is for the Americans to leave," he said. "They came to liberate us, we thank them, now they should go." "There may be gratitude for overthrowing Saddam, but the fall of Saddam is not the end of the story," Hadi said, shaking his head in agreement. "The chains we had were of iron. Now they may be of silk." "Religious extremism is the biggest threat," Hadi said. "It will come to the surface…"
"For decades, we were used to watching ourselves. Now you can think with words," said Mohammed Thamer, a poet. "But to talk loudly and to think loudly takes time. Freedom needs practice, and it takes practice to be free." To Thamer and his friends, sharing sweet lemon tea, the shadow of Hussein still loomed large. He remained, in spirit at least. Some of them joked that the statue pulled down in Firdaus Square after U.S. forces entered Baghdad was, in fact, a fake. "I don't believe Saddam Hussein's gone," said Mohammed Rasim, a painter. "He's like God. Not because he's good. But whenever we opened our eyes, we saw him, his picture, his sculpture, songs about him, poems about him. He was everywhere, even in dreams." under the fire star is a promising new blog from Chennai, with some very good writing, a beautiful look, and an interesting mix of posts. The author, Nancy, writes, "One of the few Hindi / Urdu proverbs I learned in class was: Ek anaar sau bimar. One pomegranate cures a hundred ailments." Recognizing the word "anar" from Farsi, I repeated the proverb to my pomegranate-loving Persian friend, who said, "It's Farsi, all of it. ek=yek in farsi means one; sau=sad means 100; bimar=bimar means sick. See all is Farsi with different accent!" jins ba ham-jins parvaaz; kabutar ba kabutar, baaz ba baaz: kind with like-kind flies; pigeon with pigeon, hawk with hawk. "To the ordinary man or woman, it seems a hopeless task to influence the policy of the government. But to express the desire for peace effectively, it is essential to show that, whatever the nominal issue, you will oppose any and every war thatt he folly of government may be tempted to provoke. Nothing less drastic can be expected to stand firm against the excitement which the approach of war inevitably produces. If the friends of peace are to be politically effective, they must be unwilling to listen to arguments tending to show that this war is unlike all other wars, that all the guilt is on the other side, or that the millenium will come if our side is victorious. These things have always been said at the outbreak of war, and have always been false." "One day I happened to come across a very old copy of a magazine which contained a picture of the painting "Madonna and Child" by Raphael. I was extremely moved by this painting. At the time of the Cultural Revolution the atmosphere was one of struggle, of hatred, of criticism. All around you could only see images of struggle and criticism. It was hard to find any images of peace. ..After this, I did portraits of Chairman Mao by day and then, late at night, I did some copies of the "Madonna and Child," both sketches and oil paintings..."
It's been a long day. We sang two big services this morning and then went to lunch at a friend's and talked and talked, mostly about politics. Now the sun is just setting, and even after two cups of strong tea I'm sleepy. I'm also ready to get back to regular life after this Holy Week/Easter marathon when, as a choir, we have more responsibilities than any other time during the year. And to be honest, I have trouble with Easter, like many modern-day Christians, which perhaps makes me want to slide over it quickly, to move on so that I don't have to dwell on my doubts. There has always been good company for me in that, even 2000 years ago! I learned something today: the empty tomb of Jesus was discovered by women, but one reason they were not believed was that women, under orthodox Jewish law of the day, were not considered legal witnesses. That's interesting, because one of the charges leveled at Islam is that the testimony of women and men are not considered equally; more female witnesses are required than male ones in an Islamic court of law. But the fact that Jewish women were considered the same way tells us that this inequality was cultural: yet another manifestation of patriarchal, tribal society that underlies the Judaeo-Christian heritage as well. For Christians, this is Holy Saturday, a day of quiet reflection at the end of the Tridium, the three holy days (Maundy Thursday, Good Friday, and Holy Saturday) that lead up to Easter Sunday. I was at church last night; our annual observance includes a recitation of John's passion gospel in Gregorian chant, and a solemn veneration of the cross while we sing various chants and anthems, including the unearthly "Reproaches" by Vittoria. And in what I so fervently wish could be a more common experience in Christian churches, the meaning of the day for modern times was brought home in a riveting sermon by our new priest, about his years in Central America, and what the death of Jesus and suffering of his mother meant to the real-life martyrs and their families with whom he had worked. My husband had never gone to one of these Good Friday services before, and when we got home and into bed and were lying there in the dark he said, "I think that was definitely the varsity version." For another kind of audio-visual experience, you can listen to sections of Bach's St. Matthew Passion while viewing Albrecht Durer's Large Passion Series of woodcuts. The images are from originals held by the Museum of Fine Arts, Boston. The audio clips and text (both German and translation) are taken from the Karl Richter recording of J.S. Bach's Matthäus-Passion. Lamentation scene from a late 17th century parchment manuscript in the British Library, "Octateuch, Four Gospels and Synodicon". The script at the top is Ethiopic. and such cruel inequalities among us. From Medieval art from Danish churches. This wall painting is from Nordrup and dates from around 1430. 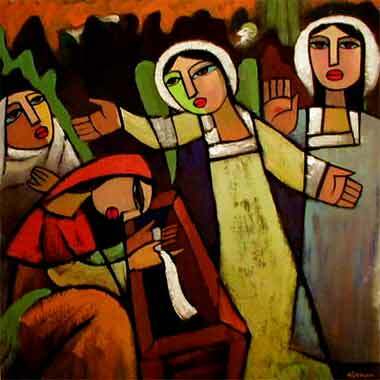 It's Maundy Thursday. "Maundy" comes from the word "maundatum", which means "commandment". At the Last Supper - which was a traditional Passover meal shared by Jesus and his disciples, Jesus washed the feet of his followers (over their objections) to indicate that he was also their servant. And he also said, "Today I give you a new commandment -- Love one another as I have loved you." In a few hours I'll be going to sing in the evening service at my church, where each year on this day we also have a footwashing ritual: the priest washes the feet of a parishioner, who then washes the feet of another parishioner, and so on, until the last person washes the priest's feet. Coming from a low-Anglican-church background (very Protestant!) to this rather "high" Anglican church (closer to Catholic in its rituals -- the inside way to say it is "smells and bells") I was aghast the first time I realized this was going to happen. Now I must admit I think it is moving, that it changes our sense of relationship to one another, and that it's symbolic of something that's in short supply these days: humility. Speaking of which, please read Robert Fisk's post in today's Independent. "America's war of 'liberation' may be over. But Iraq's war of liberation from the Americans is just about to begin." The sharp difference between Fisk's reality and that reported on domestic media reminds me, most uncomfortably, of the attitude of many Israelis and pro-Zionist American Jews about what has been going on in the occupied territories. Leave the blinders on long enough, and history also rewrites itself. At last Friday's peace vigil here, a man came up to one of my friends (she was holding a sign reading "Palestinians Need A Palestine") and said, "There is no Palestine, and there never was." My friend said well, she was sorry, but actually there was. "No," he said, "It never existed", and walked away. posted by moira at languagehat, where there is an introduction to the remarkable poetry of WWI Royal Welch Fusiliers soldier David Jones...my guess is that tomorrow we will see some of the work of Wilfred Owen; I'm looking forward to that. Well, it can’t last. So there. I have on my desk a piece of Zen calligraphy that reads: “Everything Changes”. Very true. My dad used to always say, “the worm will turn” – a phrase that mostly came up during nights when you got dealt one crummy bridge hand after another – but life has shown me that generally triumphalism is short-lived. Another family expression was “pride goeth before a fall.” We can hope – but again, at what cost, and to whom? 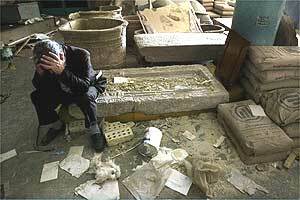 An extensive collection of recent photos, links and discussion about the 2003 Iraq War & Archaeology by independent Belgian scholar Francis Deblauwe, who begins by saying, "One thing before I go on. I wish to be absolutely clear: no epic Sumerian cuneiform tablet, majestic Neo-Assyrian lamassu sculpture or any other Mesopotamian artifact is worth a human life, be it Iraqi, American, British or other. "via wood s lot, who also just posted a number of other related links. I think perhaps we have finally entered the new millenium. Will war be its permanent face? Today as I read the heated rhetoric, now against Syria, a country that birthed part of our family and for which we have particular affection and concern, tears spring to my eyes for the millions of common people caught up in these games of power. What we all want is so simple and so universal. My friend in China writes: I have no great hope to the world, just wish everybody live in the world could have their peaceful life, woman can live with their husband and child, friends can visit each other and business person can travel just like they should do. Now it is spring, everyone here is planting in the mountain. I wish all the people could plant in the planting season, even though I know in somewhere some people cannot do that. Through the war, I have less expectation in my heart than ever before. I wish every body could live a simple live --because it had been so hard for some other people. I am imaging your garden in a new planting. I wish every year you can plant some new tree, for me, for my baby. The reality, which the Americans ­ and, of course, Mr Rumsfeld ­ fail to understand is that under Saddam Hussein, the poor and deprived were always the Shia Muslims, the middle classes always the Sunnis, just as Saddam himself was a Sunni. So it is the Sunnis who are now suffering plunder at the hands of the Shia. A couple of days ago, I watched something on TV that really made me wonder. There was this celebration thing in North Korea, people gathering and all of a sudden everybody was pointing at the clouds. Yeah, a portrait of their great leader "Kim Il Jing Jung Bil something" could be seen in the clouds. That really meant something to them. And of course to me. 30 years ago when Khomeini was supposed to come to Iran and take over the regime, people were excited with similar stuff. It was rumored one night that Khomeini's face could be seen in the moon. Another day, you would find a lock of his beard when you opened your Quran, and so on. Why are some nations looking for supermen and heroes to rule them? 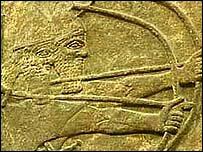 The more you read Iran's history, the more you find out that throughout the history, all kings were believed to have supreme power or authority (can't find the correct word for that. In Persian, it's called divine "Farreh", which was believed to exist in the blood of kings). As I was looking for a sign to know such nations, I came up with an idea. Correct me if wrong. It means there is something wrong with either the people, or the governing party. As a former example, consider the ex-Soviet Union. As existing examples, I would say Libya, North Korea and somehow China. Yesterday we drove a few towns south to do our monthly shopping for staples at a supermarket that’s a lot cheaper than the stores near here. It was a grim reality check. Across an endless tarmac of strip-mall parking lots, a strong wind swirled and whipped the winter’s road sand painfully into our eyes and against the sides of hundreds of SUVs and pick-ups, plastered with flags and "These Colors Don't Run" bumper stickers. Inside the stores, overweight mothers dragged bawling children around supermarket aisles; outside, country music blared from trucks where bored baseball-hatted husbands smoked cigarettes and drummed their fingers on the dashboards. A sign on one big SUV confused me: 'We're Coming" it read. "God May Forgive You, But We Won't!" What was that about? Sept 11th revenge? I almost asked the woman who got out but when I saw the sweater she was wearing -- it had an American flag knitted into one front and the ABCs on the other -- I decided confronting her would be pointless and mean. These, after all, are the parents of the kids who are being called to fight. In my parish church, up north in a university town, only person has been called up, and he’s a Naval reserve officer. Down here, as in my hometown in another state, each church might have ten or more families with children in the infantry. Where we live there is, of course, a working class, but they tend to hold fairly secure service jobs in the medical center or college, or in construction, food services or retail. But here, thirty miles south, it’s a different story. Few families have either money or education. Many have lost the high-paying jobs they once had in the now-defunct machine-tool industry; today they may be scraping by on two lower-paying jobs, with their big cars bought on credit and a day off to spend wandering around a strip mall, buying carbohydrates to eat in front of the TV and neon-colored plastic junk for their kids. It's a depressing, enormous waste of human potential – and also the most compelling argument I can imagine for spending money on education and opportunity. These are the people who get screwed the most by defense spending, non-existent environmental policies, and Republican economics in general; yet they're also the ones who support the war. Why? Because they're vets themselves and their kids are serving; because neither their education or life experience give them the reasons or tools to doubt the media message or trust anything foreign; and because war feels both exciting and somehow ennobling in the midst of lives that lack both qualities. I don't mean to slam the white working poor; these are the people I grew up with. I understand them. I just wish something could happen to make them see what an incredibly raw deal they're getting. Part of the problem is that most of these people simply cannot identify with the academic, educated liberal left. How skillfully Bush's tough-talking Texas rhetoric covers up the spoiled Yale frat-boy history they would equally despise! Meanwhile he lines his silver pockets and those of his cronies with the hard-earned wages of the working class, all the while assuring them they can keep their guns, their simple bumper-sticker sentiments, and their prejudices. I still had these impressions in my mind when I went to church this morning for Palm Sunday. When I was a child, this was a joyful day celebrating – in an irony not lost on me this morning – Jesus’s entry into another ancient city, Jerusalem, on the back of a donkey, accompanied by crowds waving palm branches and hailing him as king. It’s a long theological distance from there to Good Friday. So over the years the Anglican church has changed, encouraging parishes to begin their Palm Sunday observances with just such a triumphal procession, but also to read the passion story in its entirety. Thus the service progresses from jubilation to utter darkness and hopelessness, as we are reminded of what happened after the entry into Jerusalem – betrayal, injustice, and death – and our own complicity in the events of Holy Week that we’re about to enter. So this morning our choir sang an anthem by Palestrina: “The children of the Hebrews/ bearing branches of olive/ went out to meet the Lord/ crying out and saying, “Hosanna in the highest!” while palm branches were distributed to the congregation. Then all of us: choir, priests, acolytes, and congregation, processed around the church bearing our own palm branches before settling down to hear the scriptures. The gospel of Mark was read dramatically, with members of the congregation taking the parts of Jesus, Pilate, Peter, and narrator, and the rest of us forming “the crowd”. Thus we saw Jesus’s closest disciples deny him and flee; thus we ourselves became the mob, and called out in answer to Plate’s question of what to do with this man, “Crucify him! Crucify him!” It is always a chilling moment. This year it was devastating. If Christians construe the truth of Jesus Christ as the truth of our need to meet the stranger expectantly, war in general becomes – at the very least – problematic. But how much can we afford to pay in terms of collusion with self-deceit and the leading of others into fantasy, collusion that war in an age of technology and mass entertainment seems inescapably to involve? This of course is a question, not an answer; but it must be heard as Christ’s question to us as believers, if we are serious in calling him the incarnate truth. Whatever our answer, Pilate’s option is not open to us. Pilate said to him, “What is truth?” And when he had said this, he went out. My mother wrote a note today telling me that she felt thankful this morning when she got up "and looked out at the lake and the sun was shining and the mergansers were ducking and diving and I knew we would have a good breakfast". "Write something about hope and joy," she said, and she's right to remind me. So here is something. I went out to the garden this morning, where the ground is actually thawed and the snow has departed. There were the first stiff shoots of chives coming up from the mud, and green leaves of thyme underneath the shrubby winter-killed twigs, and to my surprise after such a terribly cold winter I saw that my climbing yellow rose had made it through. My husband had pruned the crab apple and while I worked to repair the garden fence he walked back and forth carrying armfuls of long, thin apple shoots to the brush pile in back of the garden. 'You look like a peasant carrying the family's kindling," I told him. "You might want to use these," he said, knowing that I sometimes like to weave fences and supports out of twigs, in short supply since our neighbor's big willow came down in a freak storm a few years ago. So I chose some whippy apple shoots and spent the next hour happily weaving some short border-edgings for the herbs. Then I noticed a clump of green shoots coming up out of the compost I'd spread last fall. It was a clove of garlic that had sprouted; white roots already digging deep into the soil and brilliant green shoots reaching for sky. So I separated them and gave them a little plot of their own, between the garlic chives and the Persian marze. In my garden, brave volunteers who show up unexpectedly almost always get more than a chance to fulfil their destiny. Tomorrow, Palm Sunday, I'll dig the hyacinth that is also, against all odds and climate-zone charts, coming up in the compost, and bring it into the house, to wonder at this small symbol of resurrection and its sweet, unearthly scent. "The United States, Great Britain and Iraq are signatories of The Hague Convention of 1954 for the protection of cultural property in the event of armed conflict. This stipulates that mankind should prevent, make impossible, and sanction any state or group of states from destroying, damaging, and desecrating the monuments of culture in the territory of another state. They should also ensure that national agencies should, as far as possible, exercise continued protection and maintenance of such property." And from the same issue, "The Cradle of Civilization" details Iraq's unique archaeological and cultural heritage. 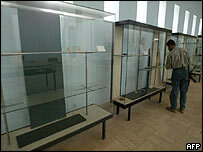 ...The national museum, which boasts the country's largest archaeological collection, was also hit. We do not know how many pieces from the birthplace of Abraham/Ibrahim (among which is a 4,000-year-old harp) were safely in underground storage. How many more historical sites are doomed? And do the invading forces care, in the theatre of war, whether a heritage will be swept away in the rubble? The museum's deputy director said looters had taken or destroyed 170,000 items of antiquity dating back thousands of years. "They were worth billions of dollars," she said. "The Americans were supposed to protect the museum. If they had just one tank and two soldiers nothing like this would have happened." More photos and descriptions of what was in the museum are here and here. OK, this loss isn't comparable to loss of human life. But as a former classicist, this strikes me as yet another huge tragedy. And I'm trying, with difficulty, to understand it. It's one thing to loot government buildings and official's homes. But one's own culture, not to mention hospitals? I don't think we can blame anger at the regime: this has to be coming out of desperate poverty, where people who have had nothing for themselves for so long are now taking anything they perceive to be of value. Well, the sun is shining here for the first day in a long while, and the snow (again!) is almost gone. I'm going to go outside and repair the bamboo fence in back of my garden so some morning glories and scarlet runner beans can grow on it this summer. Arabic calligraphy byHassan Massoudy (born in Iraq in 1944). "For the Pentagon and its neo-conservative outriders, Chalabi is the future. For the State Department, he is a charlatan, the repository of extravagant hopes that will end in tears...Listen to admirers at the Pentagon, in the Vice-President's office and at their various cheerleading think-tanks around town, and he is democracy's truest believer, a noble exile who will be given a hero's welcome by his countrymen..."
More on the murder of Shiia cleric Abdulmajid al-Khoi, from the Financial Times, the Guardian, and the Times of India. Long before I started blogging, the key Middle East issue for me has been Palestine; without a just solution, there is no hope for peace anywhere in the region. The right-wing gloating and triumphalism we've been subjected to today would be merely annoying if it weren't also so stupidly and so dangerously naive. At stake is not only a region in turmoil, but the very marrow of American morality. As Gideon Levy points out in his cautionary editorial, "America is Not a Role Model: Every Occupation is Appalling" (Ha'aretz), America would do well to look at Israel's experience. We are now set on a course which could saddle us with a giant and totally unmanageable "West Bank" stretching from the southern border of Syria and to the Euphrates and beyond. Today's suicide bombing and the brutal murder of a western-leaning Shiia cleric are grave warnings unlikely to be heeded by the euphoric and driven neo-cons. Levy, who has been a consistent voice for peace, not only makes the point that America's action in Iraq legitimize Israel's behavior in the occupied territories, but that we should learn from Israel: occupation always corrupts the occupier. ...If there is one lesson Israel can impart to the Americans, it is that every occupation is appalling, that it tramples the occupied and corrupts the occupier. 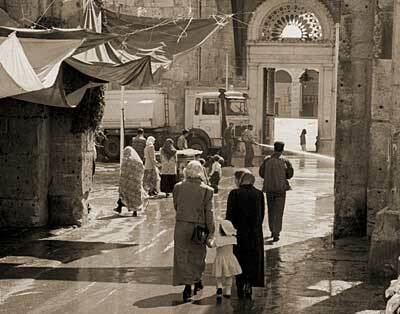 If the Americans pause for a moment to see what is going on in the Tul Karm refugee camp and in the casbah of Nablus, they will see what they will soon become. And if Israelis look at what is happening in Iraq, perhaps they will understand that it is not the Palestinians but, above all, we who have created the present situation. An occupier is an occupier, whether he comes from a democracy that is two- and-a-quarter centuries old or from "the only democracy in the Middle East." Decoding Iraq's symbols of celebration, from the BBC. Dave Hunter writes: "It's amazing to me how I see images that they show on television of something that they think is wonderful, like a destroyed Iraqi tank, and all I can think of is the life that was stilled when the tank was stopped. It hurts physically, and a poem emerges…"
Beside him if he asks. Have posted a first pass at my Book Notes for 2003. Steve Gilliard, whose excellent writing and cogent analysis I particularly appreciate, offers a balanced perspective on today's events in Baghdad in his 5:30 am post for Daily Kos. "Remember, the Catholics were happy to see the British Army in Belfast in 1969. They were there to protect the Catholics from Protestant mobs. It only took weeks before the stones started flying...As I have said before, beating Saddam is the easy part. Bringing order will not be. ...The organized fighting may well be over, which is good. But just listening to the radio, I think Americans may well be in for a brutal shock in that getting rid of Saddam didn't solve the problem. Americans are not good with subtlities. We expect problems to be solved. Saddam gone. problem solved. Well, no. Saddam gone, different problems erupt. There were crocuses blooming a week ago…such is the agony and ecstasy of spring in New England. We gauge the progress of the season by watching “our saint”, as we call him, emerging from the snow. Often it’s unusual for his head to stay covered up the whole year, but this winter he was under close to three feet from December through March. I never thought much about his identity until today, when I felt like maybe I should write something about him to go with this picture. This is a polymer bas-relief given to us by a dear friend who enjoys our garden. On the back the sculpture is labeled “St. Fiacre, patron saint of gardens”. He’s holding the Bible close to his ear, as if listening to a seashell, and down beneath the snow he’s leaning on a shovel. This poem came by e-mail today, written by my friend Dave H., a physician who has seen more than his share of human suffering. He and his wife have also traveled lightly and with wide-open eyes and hearts all over the world, and are filled with love and appreciation for diverse cultures and peoples. He says, "You write beautifully and intelligently about a war that is so ugly and heartbreakingly incomprehensible. My reactions are far more visceral. I feel the images of death inside of me and they burn forth as short poems, usually during sleepless nights when I'm awakened by the nightmares of the pictures and tactics of death." I hope he'll send us more poems. Today on my walk down to the post office I passed a rental house that's home to several Vietnam vets. I noticed that they had hung out a black "POW/MIA" flag in the last few days. These men all suffer from physical or mental disabilities related to their military service. Not one is able to work or drive, and none are married; they live here because our village is one of the only cheap places in this region, and this particular house is close to the bus stop. One man is in a wheelchair, another can barely walk. The most able seems to be a hefty Native American with deeply tanned skin, long jet-black hair held by a twisted bandana headband, and a penchant for sitting in a lawn chair with his chest bare even on cold days. The men spend most of their time, in good weather, playing poker in the sun and watching the traffic; they yell "Hey, babe!" at me when I wave at them from across the street. Yes, their identification with their veteran status includes a kind of heroism and pride -- what else do they have? I think any one of them would trade his current life for a second chance at love, mobility, work, and health. It takes more than a uniform to change a person from "innocent" to "soldier", and their suffering from "collateral damage" to "heroic sacrifice". It is very, very difficult to turn without intense anger from a description of a young Baghdad boy who just lost both arms and is pleading, "Where can I get new hands?" to a photograph of President Bush and Prime Minister Tony Blair, smiling and relaxed, in their perfectly-fitted suits. I feel the same anger and sadness when I pass my neighbors and contemplate their irreparably changed lives. In addition to the butchery we are inflicting on the Iraqi "military", when are we going to admit what we are doing to the poor and disadvantaged young people who enlist in our armies and get sent to our wars? When are we going to admit the horrible legacy that war visits on all human beings: soldier and father, mother and son, reporter and fruit seller, the child clutching her doll, the ninety-year-old grandmother who wishes she were blind? Photographs of Kaveh Golestan's funeral. I was struck by the one of two mourning women, surrounded by a wall of press photographers - not for the obvious reason of grief being intruded upon by the media, but by the space that did seem to surround the two women, a space created by shared grief and relationship, and, frankly, seemingly impervious to anything else. A gifted Iranian photographer and cameraman for the BBC was killed April 1 when he stepped on a landmine in northern Iraq. "Kaveh Golestan was an outstanding photojournalist who had worked in support of freedom of expression in his native Iran and elsewhere," said BBC news director Richard Sambrook. Golestan, who was 52, was awarded the Pulitzer Prize for his coverage of the gassing of the Kurds during the Iran-Iraq War in 1988. Here is an account of his life, and his striking photo essay, "Those Days", about the Iranian revolution. Check out the "Ten-Second Film" contest and the quite wonderful winning entry, "Walking Haiku" by Sorrel Ahlfeld. More than one third of America's citizens have survived the relentless propaganda they've been subjected to, and many thousands are actively fighting their own government. In the ultra-patriotic climate that prevails in the US, that's as brave as any Iraqi fighting for his or her homeland. Most courageous of all, are the hundreds of thousands of American people on the streets of America's great cities - Washington, New York, Chicago, San Francisco. The fact is that the only institution in the world today that is more powerful than the American government, is American civil society. American citizens have a huge responsibility riding on their shoulders. How can we not salute and support those who not only acknowledge but act upon that responsibility? They are our allies, our friends. L.A. Times photographer Brian Walski, who has been covering the war in Iraq, was just fired for sending the paper a manipulated image that combined two photos he had taken. Walski wrote an apology: "This was after an extremely long, hot and stressful day but I offer no excuses here. ..I have always maintained the highest ethical standards throughout my career and cannot truly explain my complete breakdown in judgment at this time. That will only come in the many sleepless nights that are ahead." The incident will no doubt have a lasting negative effect on Walski's career. My probably-unanswerable question: was this a normal lapse in judgement? The result of a highly-competitive, adrenaline-rushed journalistic atmosphere? An unfortunate casualty of the stress of war itself? It's very possible that Walski himself doesn't know. It's a fact that when human beings are subjected to unfamiliar, dangerous situations, lack of sleep, and prolonged stress, we may react unpredictably and in ways that will haunt us for the rest of their lives. Putting our young people into these situations is one of the aspects of war that simply doesn't get talked about very much, yet we are highly prone to judging their actions after the fact. And while there is a big difference between a young, frightened soldier killing civilians at a checkpoint and a seasoned war reporter making a blatant error of judgement, the fact remains that none of us know how we would act or react in the same situation, or what combination of psychological, emotional, cultural and physical factors would be working on us at the time. "But I don't think Jesus was a violent man - in fact, the opposite - and I don't think God takes sides in war. Everyone told me it was futile to try to get out." Beyond the reports they're posting, what is daily life like for embedded journalists? Jules Crittenden of the Boston Herald is now embedded with the Army's 3rd Infantry Division, and he's writing descriptive, reflective pieces with a lot of (literally) gritty detail for the Herald and Poynter Online. Next week, Christians will be celebrating Palm Sunday. The difference between that event and the above attitude is that Jesus rode into Jerusalem on a donkey (a symbol of peace in his day) to show to all present that he was a man of peace, not war. That fact seems conveniently forgotten by some in the Christian community -- which is both revealing and revolting.